As with my gold analysis today is based on the monthly chart for spot silver which gives us a longer term perspective for the industrial commodity, and in this case the technical outlook is a little less clear. Last month’s long leg doji candle was a repeat of May’s price action, which in themselves suggest a market that is indecisive and therefore reaching a possible turning point as a result. However, against this we need to balance the factor that the lows of both May and June failed to breach the 9 month moving average which provided an excellent platform of support. 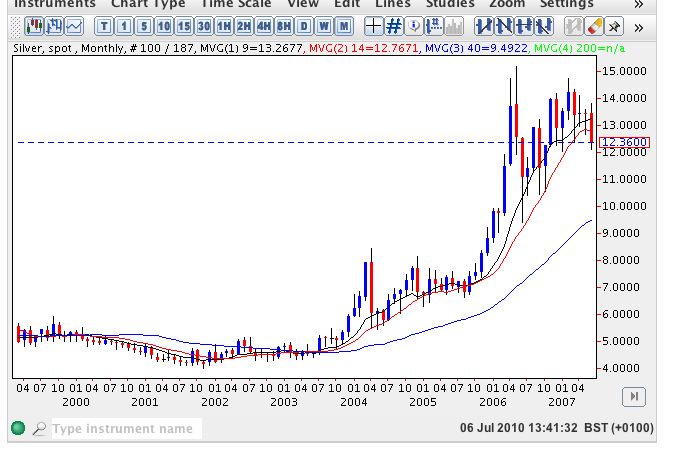 At present spot silver prices are trading above all three moving averages and therefore moving forward the longer term trend remains firmly bullish, as for gold, but for this to be confirmed for a comfortable trend we need to see the $20 per ounce price point breached and once this has been cleared on the monthly chart then expect to see spot silver surge higher in due course. In the “shorter” term we may see a minor pullback as a result of the doji candles outlined above.